My research focuses on the impacts of parasites and disease on marine populations. Since beginning my studies in 2008, I have traveled extensively, working with collaborators in the USA and Canada, gaining valuable experience in a range of disease detection methods and learning more about marine management strategies. 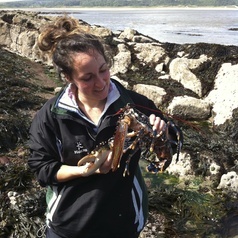 My doctorate at the Department of Bioscience, Swansea University (UK) focused on determining the health status of commercially important European crustacean populations; susceptibility to disease, the effects of invasive species and how fisheries closure can impact the health of crustaceans. My postdoctoral fellowship at the National Autonomous University of Mexico's Reef Systems Unit (Institute of Marine Science and Limnology) investigated the relationship between habitat type, benthic component cover and invertebrate biodiversity on the presence of disease. I am currently the Scientific Officer for the Bluefish project at Swansea University, where I am using eDNA and crustacean species to map disease connectivity in the face of climate change. I am passionate about outreach and sharing science in a fun and interactive way.